Albert fussed when his mum told him to go to bed. “I want to stay up, Mum,” he whined. “But Albert, you have to go to bed. You need your sleep,” Mum said. With no other excuses in mind, Albert had no choice but to get into his bed. “You'll sleep fine. I'll put a candle on the table so it won't be so dark.” Mum kissed his cheek and closed the door. That night his mum went into the bedroom first. She lifted up the covers. “Look, Albert. There are no monsters under your bed.” She opened the closet door. “There are no monsters or ghosts in your closet. The house is safe and your dad and I are in the living room.” She lit a candle. “I'm leaving the candle for you, so it won't be so dark.” She shut the door behind her. Albert knew there were no monsters under his bed. His mum had checked. He knew there were no ghosts in his closet. She'd checked there too. Still, he was afraid. He sat on the bed and laid his back against the pillow, watching the candlelight flicker. 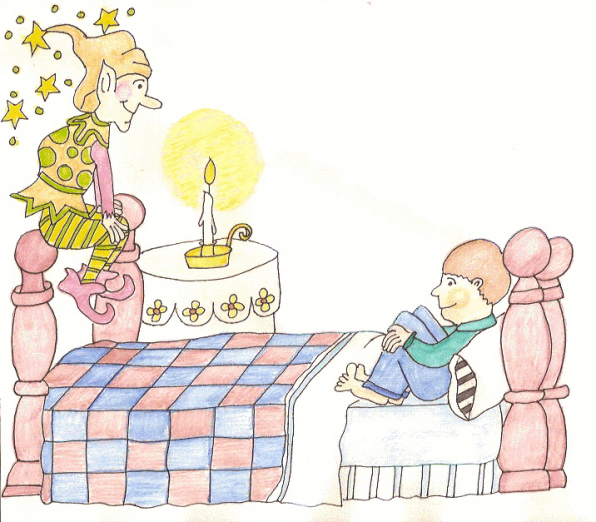 Just then a few twinkling lights appeared at the bottom of his bed. He pulled the covers up over his face. The lights got brighter and bright green sparkles glittered. Albert peeked out. “Hello there.” A strange little man sat on the bottom of Albert's bed. “You're my fairy? You watch over me at night?” Albert sat up. “What do you want my name to be?” The fairy raised into the air. “I want your name to be Gary, no Peter,” Albert said. “You promise to stay and keep me safe?” Albert slid back under the covers. “I promise. Just because you don't see me doesn't mean I'm not there. Now, I'd better become invisible again before I get into trouble.” The fairy disappeared. “I'm still here,” it said from the corner of the room. Albert rolled onto his side and for the first time in months, fell asleep and slept all night long. Albert nodded and smiled. He was going to keep Peter a secret. “I will sleep good every night from now on. I'm not afraid of the dark any more.” And he did.